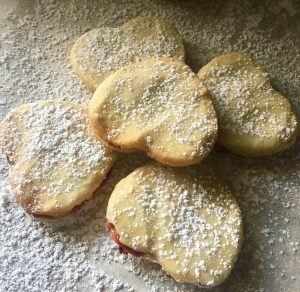 Linzer cookies – Easiest cookie you will make! My mom introduced me to a version similar to this cookie not too long ago. This is literally the easiest cookie to make. It just melts in your mouth. It will unquestionably be a crowd pleaser for your next gathering. These aren’t the healthiest of cookies but definitely a go to when you want to indulge. The dough takes 1 hour to rest hence the time frame. Gather all your ingredients. First, mix all the sugar and room temperature butter together. I like to use a spatula. A mixer or whisk isn’t necessary. Slowly start adding the flour into the sugar and butter mixture until it is all stirred in there. Put this mixture into the fridge for an hour to cool. Once an hour is passed, take out the dough and roll it out if you would like to use a cookie cutter. My mom likes to make small shaped balls out of the dough and bake it that way. You can see I used a heart shaped cookie cutter; just spreading the love! Preheat the oven to 350 degrees. Bake the cookies for 10-12 minutes until slightly golden brown. Let the cookies cool. 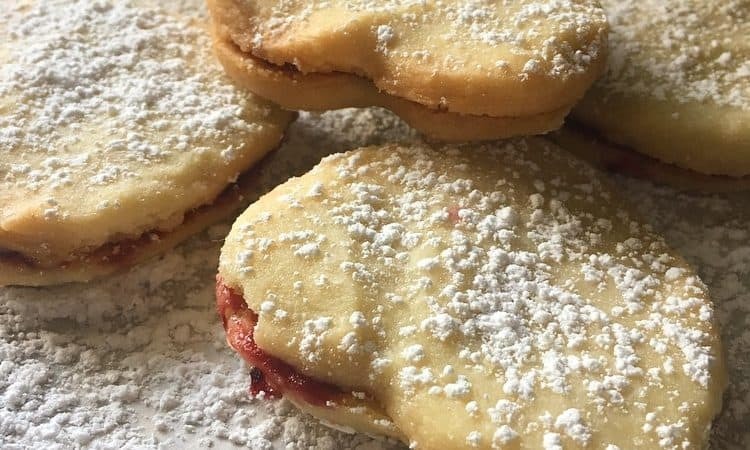 Once cooled, whip out the raspberry jam and spread it onto the inside of the cookie and sandwich it with another cookie! Then dust some powdered sugar on top-looks more festive that way. If you like, you can just enjoy the cookie as is 🙂 No jam is even needed. 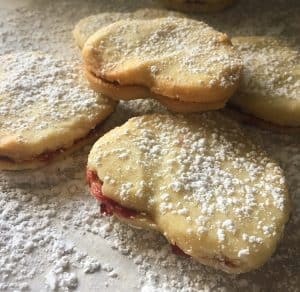 A traditional Linzer tart cookie does have raspberry jam in between though. Also, you can add some lemon zest to the dough mixture for some freshness & tartness if you would like. That’s why i love it! It is so easy 🙂 Happy you enjoyed it! Previous Post Chicken Veggie Curry Stew – A comforting nutritious one pot dish!